Of all the horses in this field, I think that Frosted has the best chance to outduel American Pharoah down the stretch. Heck, Frosted may have won the Kentucky Derby had it not been for a disastrous start out of the gate. Frosted will be ridden by jockey Joel Rosario, who won the Belmont a year ago, and should be on fresher legs due to having not run the Preakness. 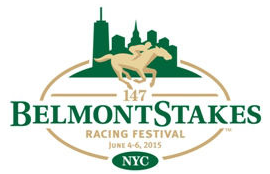 So yes, I do not have American Pharoah winning the Belmont Stakes and thus, the Triple Crown. But as I alluded to earlier, American Pharoah is a perfect fit for the longer distance at Belmont of a mile-and-a-half due to his excellent closing speed. But I think the fresher legs of Frosted will be just enough to pull the upset. This horse has drawn some comparisons to last year's winner Tonalist thanks to a win in the Peter Pan Stakes. That win has also seen him get some buzz as a pick to win, although I am not certain that he can beat American Pharoah after failing to beat him the previous two times. I don't mind being wrong to see a little history.